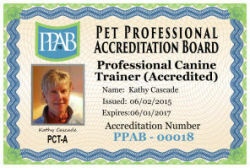 Cascade Animal Connection was founded in 1996 by owner and Certified Tellington TTouch Instructor, Kathy Cascade. Kathy employs positive, force-free training methods based on motivational techniques, clear communication, and respect for our animal companions. 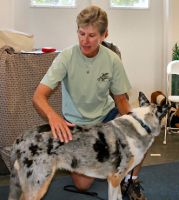 With the goal of making training fun and successful for both animals and humans alike, Kathy is known for her creative and engaging teaching style. She has taught workshops and seminars throughout the US, Canada, and Europe for the past 18 years, and offers private training sessions in the Central Oregon region. The foundation of Kathy's work is the Tellington TTouch Method. This innovative technique employs the use of gentle touch and movement exercises designed to reduce stress and build confidence. Recognized for her compassionate and skillful approach to working with dogs with extreme fear and aggressive reactions, Kathy offers effective solutions for even the most challenging behavior issues. Kathy teaches a variety of one and two day Tellington TTouch Workshops and S.A.N.E. Solutions Seminars, which is now also available as an online, on-demand course. Kathy also offers private training sessions in the Central Oregon area including, Bend, Redmond, Sisters, and Madras. Please view the services page for full descriptions of each workshop and details on hosting an event or scheduling a session. Coping with the stress of living in our sometimes chaotic human world can be a challenge for our animal companions. 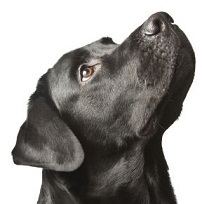 Dogs in particular often develop behavior issues related to anxiety, fear, and environmental stress. Unfortunately, some training approaches that rely on the outdated concept of dominance and punishment only worsen these behaviors. The first priority of any animal is to feel safe. Our criteria for the use of any training technique or tool is that it not only be effective, but also fair, humane, and respectful. The ultimate goal of compassionate training is to develop a trusting and mutually cooperative relationship with your animal companion. Please visit all of our links and resources on the site to learn how Cascade Animal Connection can assist you and your four legged friends. Be sure and join our email list for clinic announcements and other valuable information. Available on-demand at Dognostics Career Center.